Food Adventures of a Comfort Cook: Another successful attempt with Apricots. Another successful attempt with Apricots. While picking apricots the other day, I spied a very colorful bird in the tree pecking at one of the fruits. It had a yellow underbelly, dark blue top and wings and a bright red head; very tropical looking indeed. One of the outdoor cats began to climb the tree and suddenly a small flock of these unusual looking birds took off to safety. I looked up Utah bird species online and discovered it was a bird that lived in mountainous areas, mostly in evergreen trees, and rarely seen. 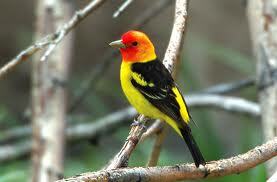 It is called the "Western Tanager" and here I had a flock of them in the apricot trees; astounding. But I digress from what this post is actually about...the apricots. 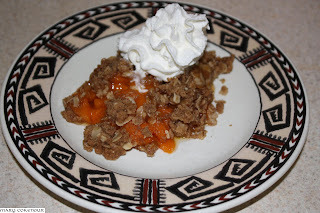 As I had planned, I was able to make an apricot crumble today. Now I am one of those people who doesn't really like cooked fruit. While I will cook and bake with fruit for other people, I will not eat it myself; just call it my little quirk. I was brave and took of taste of it; sweet and tangy, but still not my cup of tea. Roy, on the other hand, enjoyed it and praised me for an experiment in baking well done. So here is my experiment...ummm, recipe and I hope you enjoy it too. Preheat oven to 375F. Grease a 4-qt baking dish with the one Tbsp of softened butter. In a large bowl, mix together the apricots, vanilla, sugar and cornstarch; set aside. In a medium bowl, use a pastry cutter, fork or hands to mix together all ingredients listed under Topping until it forms a loose crumble. Spread the apricots into the baking dish; use a rubber spatula to get all the juices that have formed at the bottom of the bowl. Next, spread the crumble over the apricots and spread as evenly as possible. Place dish on center rack of oven and bake for 40 minutes; remove from oven and let it rest for 15 minutes before serving with a scoop of ice cream or whipped topping. And nice recipe, too. Unfortunately, I live in climes too cold for apricots. And those I can buy are quite expensive and no longer good. Have to wait till next year.